Pinball Arcade was developed by FarSight Studios and published by Crave Entertainment. It was released on April 4, 2012 for 800 MSP. A copy was provided for review purposes. 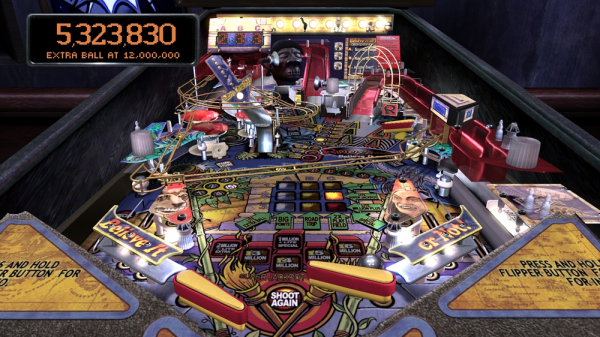 Pinball Arcade is bringing a new feel and set of priorities to the XBLA pinball landscape. Long dominated by the venerable Pinball FX2, there is now another choice on the market that both borrows from the latter while striking out in its own direction as well. Having already developed the highly regarded Pinball Hall of Fame: The Williams Collection, FarSight is no newcomer to the genre. They have brought their expertise to craft a game that accurately recreates classic pinball tables. The resulting product is one that will feel immediately familiar to veterans but distinct enough to warrant its own release. It’s the middle of the night, you’re roaming the highway in your supped up turbo-charged Supra, headlights flash in your rear view and, in a blink of an eye it’s on. This is the premise behind Crave Entertainments classic racer Tokyo Xtreme Racer, originally launching for the Dreamcast in 1999. This game had huge aspirations when it launched. Not only were they venturing into new territory as being one of the first mission based games, but they were also introducing a new style of racing that most people didn’t even know existed. Tokyo Xtreme Racer broke the mold in many ways for the racing market, introducing a huge line of non-licensed look-a-like vehicles and aftermarket parts. Everything here was customizable: rims, body kits, wings, paint, ride height, gear ratio-giving you an amazing since of realism and depth. Sure, today this seems standard, but for the late 90’s this was huge. About the only thing this deep was Gran Turismo, which was exclusive to PlayStation. It was one of the 20 or so titles available for the Dreamcast at launch. It completely stood out against all the other racers that launched, including the hugely loved Hydro Thunder. Let’s jump into the drivers seat and see why Tokyo Xtreme Racer is on the Most Wanted list.